Pengertian dan 23 Contoh Kalimat Predicative Adjective – Predicative Adjective adalah adalah kata sifat yang diletakkan setelah noun (kata benda). Fungsi dari predicative adjective sebagai penjelas kata benda, hanya saja antara noun dan adjective dihubungkan dengan linking verb (is, am, are, has, have, etc). Selain itu predicative adjective juga dapat diikuti oleh qualifiers (very, enough, seldom, etc). Predicative adjective mengisi posisi subject complement. She told me that she is lonely after her mother passed away. The foods that cooked by my mother are delicious. The Korean drama that I watch last night is very heart-breaking. My brother’s car is very expensive. My book looks similar with Lina’s book. Even if she got into a trouble, she stayed calm. Today the weather is cool. Vitamin C is good for our health. After doing my homework, I feel sleepy. The man that standing on the corner looks ugly. The sky turns dark at night. They common room is large. I am alone at home. Rani’s house is very big. Her body is small because she often exercising. I love to eat food which is spicy. The hotel on Ahmad Yani street is very luxurious. His house is always quite. I thought that my bedroom is cozy. Itu tadi pengertian dan contoh kalimat dari predicative adjective. 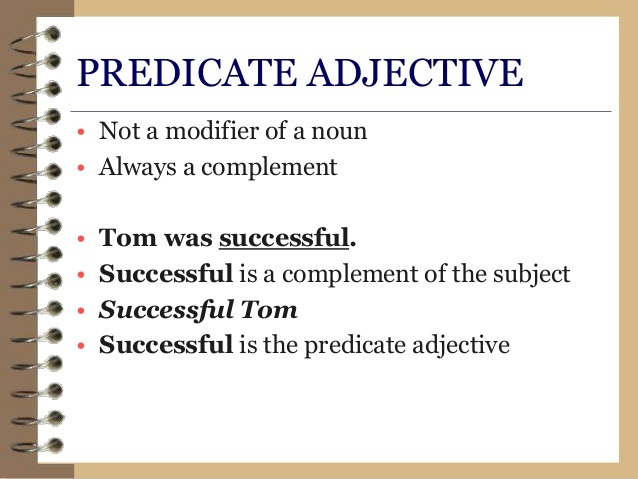 Dalam membuat kalimat menggunakan predicative adjective hanya perlu meletakkan adjective (kata sifat) setelah noun (kata benda).